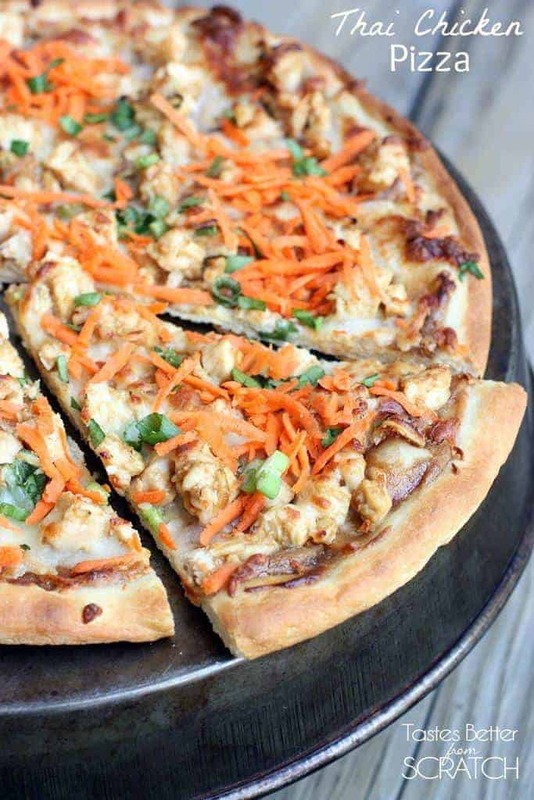 Calling all pizza lovers–this Thai Chicken Pizza is one of my favorites! 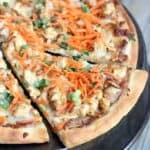 My favorite homemade pizza crust smothered with a Thai peanut sauce and topped with chicken, cheese, onion, cilantro and carrots. The flavors are amazing! Even my husband, who’s a pepperoni pizza kind of guy, loves this one! In food processor or blender, combine peanut butter, vinegar, soy sauce, oil, red pepper flakes, ginger, honey and sesame oil. Set aside. Season chicken with salt and cayenne pepper and saute in olive oil until no longer pink. Cut chicken into bite sized pieces and coat with 2 tablespoons of the peanut sauce. Spread peanut sauce over the surface of your pre-baked homemade pizza crust. Scatter chicken pieces over top and sprinkle with green onions. Sprinkle with cheeses. Bake for 6-8 minutes or until cheese is bubbly. Remove from oven and sprinkle with shredded carrot and cilantro. What a great blog…love it! Wow, this looks amazing, not to mention so creative! I love Thai flavors, but I never would have thought to put them on a pizza. My mouth is watering, just looking at these photos! All of the Thai flavors so good on a pizza–it’s unique for sure and completely delicious! I would love to make your thai pizza. I was wondering what size pizza crust I should make for that? I love your recipes and I have made a few of them and they are delicious!!!! About a 12 inch pizza crust. I use 1/2 of this pizza dough recipe! This was different and so tasty. I loved the mix of flavors! Doubling the sauce was a good idea too! It is such a great combination of flavors–Im so happy you enjoyed it!